Introduction: Anastomotic leakage is the most important complication after low anterior resection for rectal cancer. Several studies have assessed the association between risk factors and anastomotic leakage in open surgery using a stapling technique. However, only a few studies have evaluated the risk factors for anastomotic leakage after laparoscopic surgery. 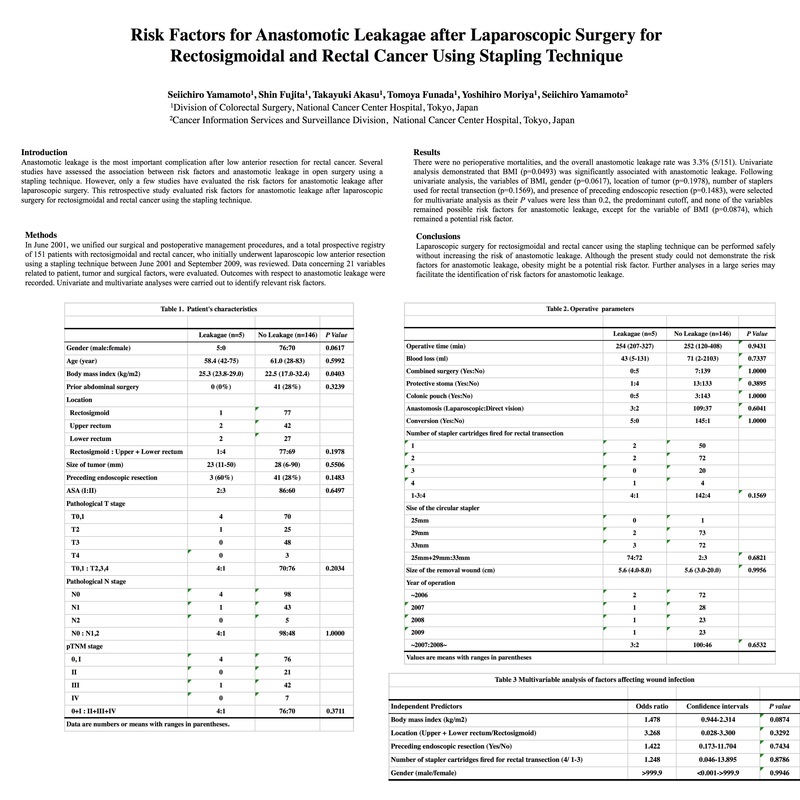 This retrospective study evaluated risk factors for anastomotic leakage after laparoscopic surgery for rectosigmoidal and rectal cancer using the stapling technique. Methods: In June 2001, we unified our surgical and postoperative management procedures, and a total prospective registry of 151 patients with rectosigmoidal and rectal cancer, who initially underwent laparoscopic low anterior resection using a stapling technique between June 2001 and September 2009, was reviewed. Data concerning 21 variables related to patient, tumor and surgical factors, were evaluated. Outcomes with respect to anastomotic leakage were recorded. Univariate and multivariate analyses were carried out to identify relevant risk factors. Results: There were no perioperative mortalities, and the overall anastomotic leakage rate was 3.3% (5/151). Univariate analysis demonstrated that BMI (p=0.0493) was significantly associated with anastomotic leakage. Following univariate analysis, the variables of BMI, gender (p=0.0617), location of tumor (p=0.1978), number of staplers used for rectal transection (p=0.1569), and presence of preceding endoscopic resection (p=0.1483), were selected for multivariate analysis as their P values were less than 0.2, the predominant cutoff, and none of the variables remained possible risk factors for anastomotic leakage, except for the variable of BMI (p=0.0874), which remained a potential risk factor. Conclusions: Laparoscopic surgery for rectosigmoidal and rectal cancer using the stapling technique can be performed safely without increasing the risk of anastomotic leakage. Although the present study could not demonstrate the risk factors for anastomotic leakage, obesity might be a potential risk factor. Further analyses in a large series may facilitate the identification of risk factors for anastomotic leakage.